Fresh air and peaceful surroundings make for a good night’s sleep. 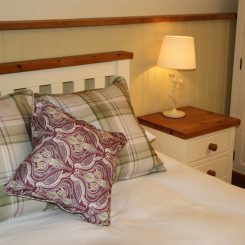 Beside the pub a converted building houses five well appointed rooms, self contained providing unrestricted access. Quietly situated with ample parking, most rooms have views of the green and the countryside beyond. 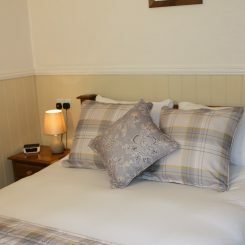 The rooms, four double and one twin and are all contemporary furnished with modern en suite facilities and offer the comforts expected of a four star silver rated inn. 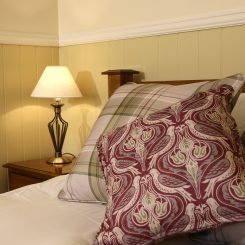 Rooms benefit from flat screen TVs with Freeview channels, wifi internet access and modern heating. 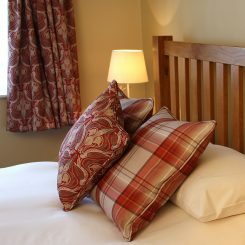 Beds are of quality with feather down pillows and quilts clad with crisp white cotton. 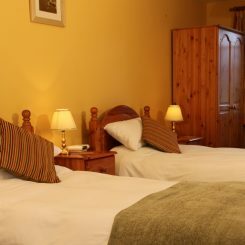 Fluffy towels, luxurious toiletries and a generous hospitality tray are also provided. The pub’s delightful dining room is where breakfast is served, between 8.30 and 9.15am. 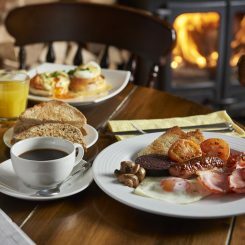 A selection of fresh fruit, cereal and homemade preserves are complimented by a freshly cooked English breakfast, several fish dishes are available too. Check in time is from 2pm and rooms need to be vacated by 10am. We regret we do not accept pets or children under the age of 12. We regret we cannot accommodate guests attending local weddings, who simply want a convenient bed for the night. Wedding guests require different needs to our regular guests who value our good food, warm hospitality and peaceful position. This decision has been made in the interest of our regular guests and our own business.